Can Made-For-Instagram Installations Still Be Considered ‘Art’? What the Color Factory, Museum of Ice Cream and the like say about the future of art. “Is this art?” is a question that predates the digital age. But the “rise of made-for-Instagram exhibits,” as Wired explores in this video, throws a social media-shaped wrench into that query: if an installation is created for the sole purpose of becoming Insta-famous, does that make it less worthy of being called art? 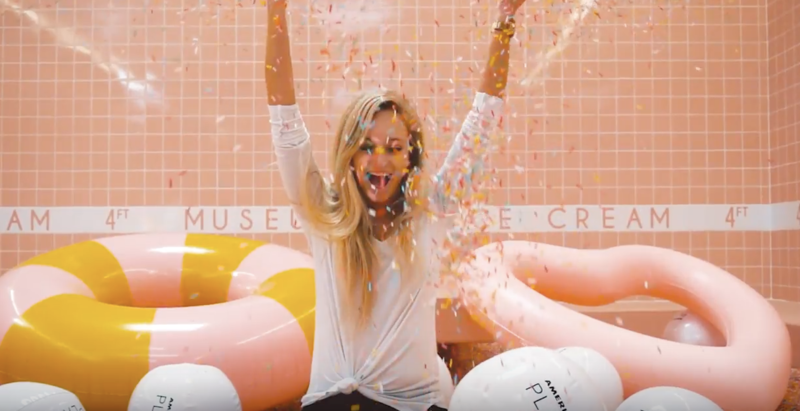 In the video, Wired‘s Arielle Pardes talks to creators of two such spaces: Jordan Ferney, founder of the Color Factory in San Francisco and Maryellis Bunn, founder of the Museum of Ice Cream, with locations in both San Francisco and Los Angeles. The Museum of Ice Cream was “designed to be reproduced on Instagram as much as it is to be enjoyed in real life,” Pardes says. Unlike traditional museums, Bunn adds, “we’re a brand.” The idea is to get people to be an active participant, rather than observer, in the space (if you can get in, of course—tickets to the Museum of Ice Cream have been sold out for months). These installations, unlike say the famous pink Paul Smith wall in Los Angeles that’s been Instagrammed into oblivion, seem to provide value aside from a good Instagram photo though: namely, they’re fun. Ferney says that “we can make a beautiful photo that will look really good on the internet” adding “but it was really important to me that Color Factory was more than that.” Each room was designed in collaboration with artists, and was meant to give people the chance to do something that they wouldn’t or couldn’t do in their day-to-day routine, like play in a room full of ribbons or run through snow machines shooting out confetti. But if they’re fun for a photo, and not necessarily as good offline, what does that mean for their so-called status as “art”? As to the question of whether these spaces qualify as art, Ferney wisely responded that “I’m not gonna be the one to say if it’s art.” That seems fair given that “art” is a highly subjective category. But the bigger issue here is not that these spaces are made for Instagram, as seemingly everything today is made with Instagram in mind. It’s that these spaces are created to be adult playgrounds and a huge part of that play depends on being able to prove that you’ve played. (As the saying goes, Instagram or it didn’t happen.) It is not experiencing for the sake of experience: it’s doing something specifically so you can record it and post it to your followers. Plus, these whimsical wonderlands encourage you to shake loose from your daily routine, but also rest on the idea that you’ll be grabbing your smartphone to do it. And to think that spaces are made less habitable in real life so that they work better on social media is a strange thought indeed.